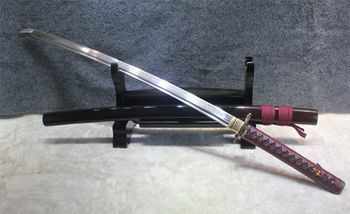 Samurai Swords were long used as weapons. After World War II, these items have become traditional products that serve for decorative purposes or collection ends. 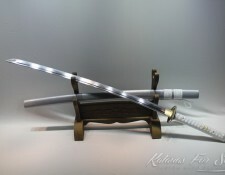 Still, they are used in Dojos for Kata practices and casual displays. 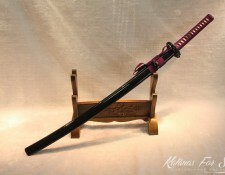 Traditionally made, Samurai swords, or Katanas, are artistic assemblies of several pieces which are chosen according some criteria: the purpose, and the price. 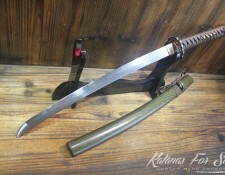 These factors have real impact on the forging processes and the mounting operation of the Katana. The first thing affected by the considered factor is the material. 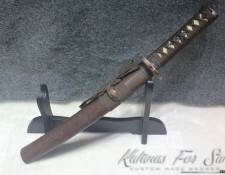 The chosen material would guide forgery processes and item selection because every material type has its particularities and it strongly influences the characteristics of the resulting katana. 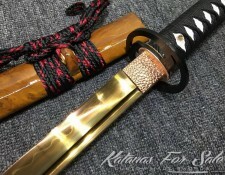 Actually, it is important to know the material properties to know the Katana characteristics. 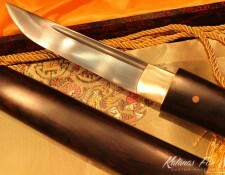 1060 Carbon Steel is a high carbon steel. The number 1060 refers to a material made of an alloy of Iron with a Carbon tenor of about %0.60. Others elements can be found mixed to this alloy but their tenors are not very significant. 1060 Carbon Steel Is harder than 1045 Carbon Steel; this property makes this steel harder to forge. The high Caron tenor makes the 1060 Steel more durable, but it is not high enough to compromise its pliability. 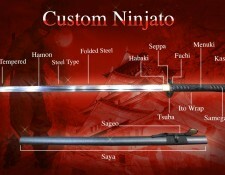 Actually, the swords made of 1060 Carbon Steel keep their edges sharp longer and they are more expensive. 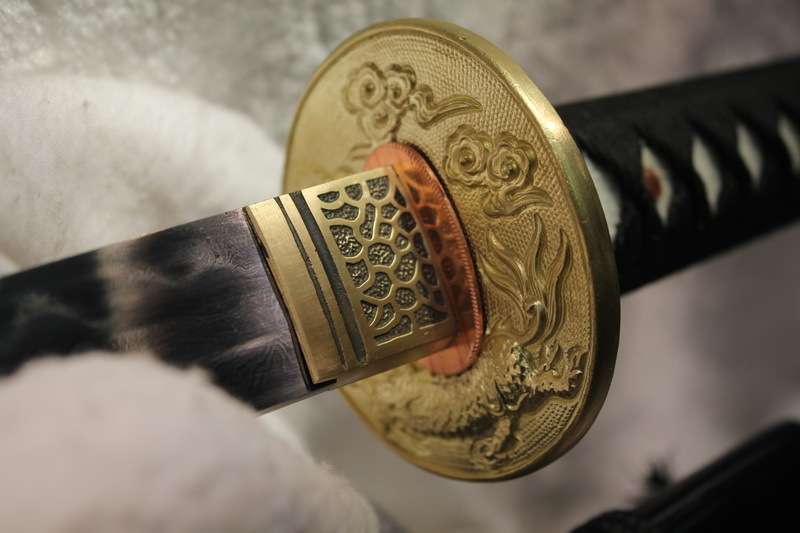 It is the favorite steel material of famous swords companies. 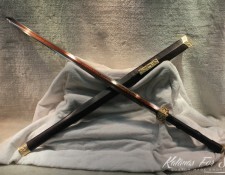 1060 Carbon Steel Katanas inherit the durability and the hardness of the steel material. 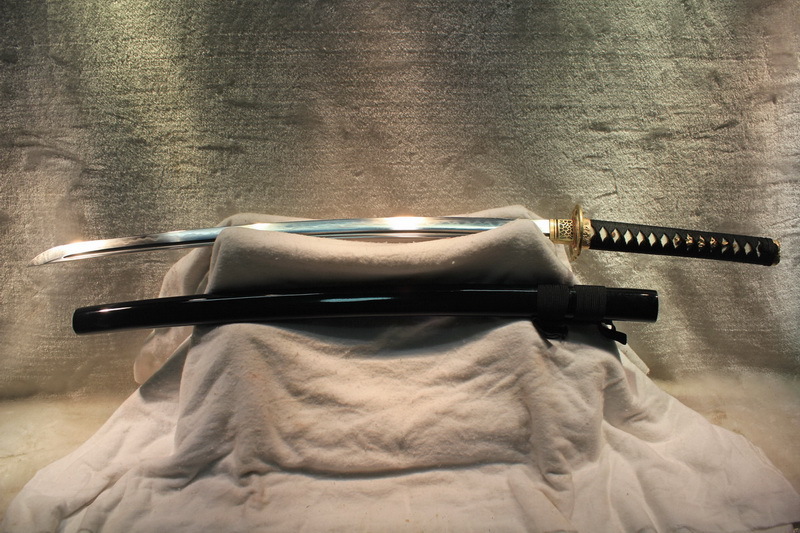 1060 Carbon Steel Katanas require more effort to produce. 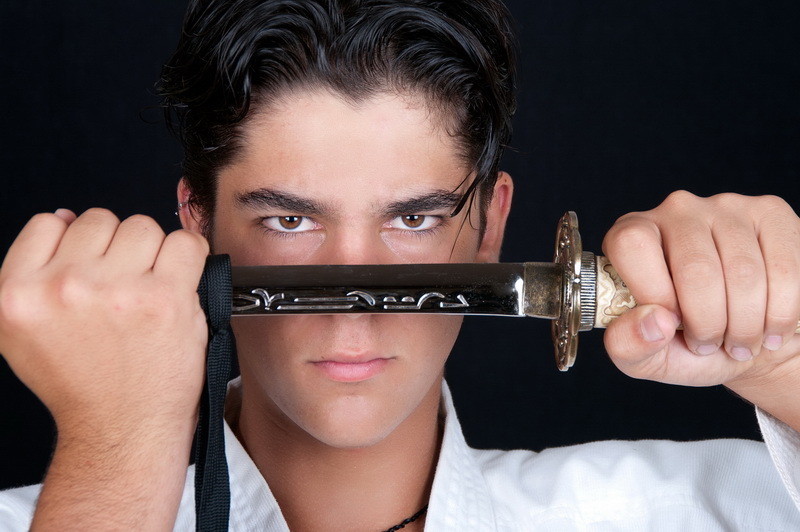 The edge is durable and the sharpness lasts longer. 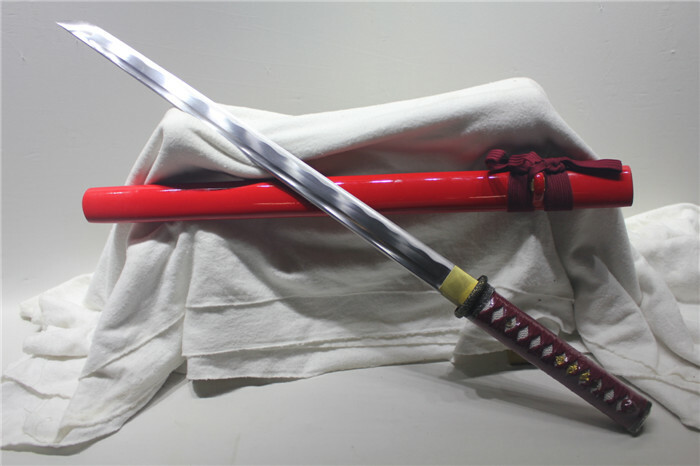 It is more resistant to corrosion and oxidation and therefore requires less maintenance processing than the 1045 Katanas. 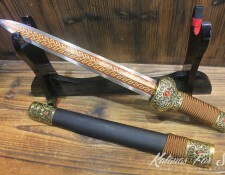 Though, it is very important to clean the blade and polish it after every extensive use to ensure the durability and the sharpness, and to keep the edge “healthy”. 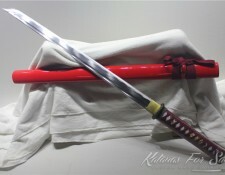 1060 Carbon Steel Katanas are expected to be heavier than those made of 1045 Carbon Steel, because of the steel properties. 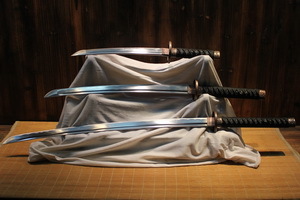 These Katanas create curves while being forged. This is the property of high and medium Carbon Steels: they keep a certain softness which makes them to develop ideal curves during the clay tempering processes and folding operation. 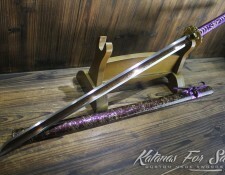 The differential hardening and the folding operations, which are meant to harden the blade can increase the weight of the piece; this situation is handled by an aesthetically implanted blood groove that help eliminate the extra weight but keep the resulting spine from the differential Clay Tempering process. 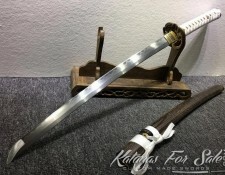 1060 Carbon Steel Katanas have the medium rank between 1045 and 1095 Carbon Steel Katanas. It appears that they are appreciated for their durability, their hardness and for their affordable price if compared to properties. 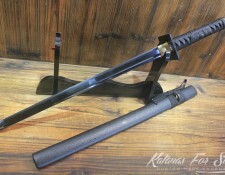 The easiness of forging reduces dramatically the price of the 11060 swords and makes them very popular; Mokko Ko Katana is a famous sword made of this Carbon steel Type. 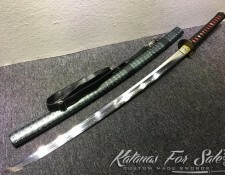 1060 Carbon Steel Katanas are more suitable for relatively frequent dojo cuts and displays; they are useful when it is about casual outdoor cut. 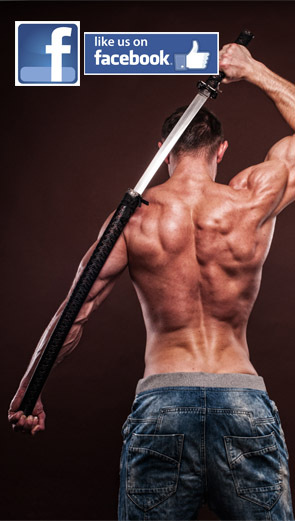 Their weight can make them less suitable for Kata practices. 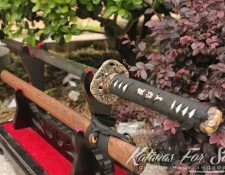 They can be mounted according very beautiful combination of parts according the purpose of the katana order. 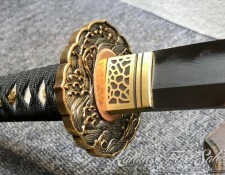 Thus, if it is intended to be decorative, 1060 Carbon Steel can be Full or partial Tang, Tsuba and Tsuka can be made of soft but with appreciated ornamental properties. Normally The blade can be mono tempered or with several Clay Tempering repetitions, however we do not offer clay tempering for 1060 carbon steel, but for higher quality blades we do. 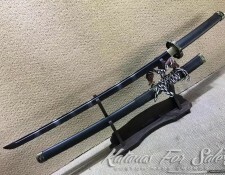 Briefly, there are no major constraints for mounting the Decorative Katanas. 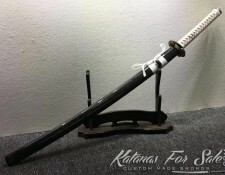 If the sword is intended to be used in Kata practices, Dojo cuts and displays, the parts to mount on the blade are to choose carefully to fit the characteristics of the blade material and the forging process. 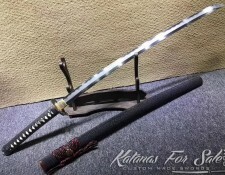 The edge of the 1060 Carbon Steel Katana keeps its sharpness more than the medium Carbon Katana, that’s why this sword is more popular among functional users. 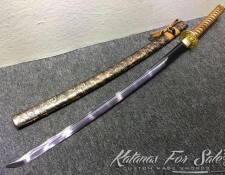 The major part of 1060 Carbon Steel Katanas for sale are Hand forged and due to the hardness of the steel material they are made of, the price tends to be high. 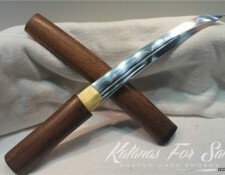 Certainly, every hand forged piece is unique even if they share the overall length, weight and some other properties. 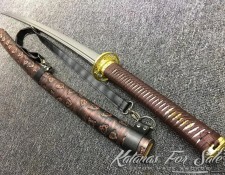 This particularity adds an ornamental value to decorative Katanas. 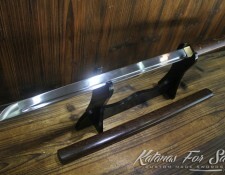 They are therefore associated to the finest accessories to complete the master piece produced by the proficient smith. 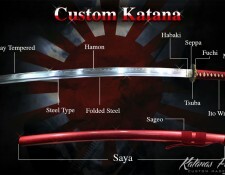 1060 Carbon Steel Katana is customizable from the forging to the mounting processes. 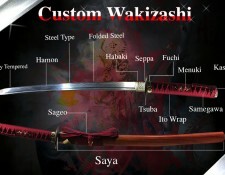 You can chose the Hamon type, the sharpness of the edge, the hardening type and even the forging process. 1060 Carbon steel is hard steel but it is susceptible to hand forging, special press mechanical devices and to milling by dedicated machinery. Opting for 1060 Carbon Steel material is to choose low price material that can be forged into resistant and valuable pieces. 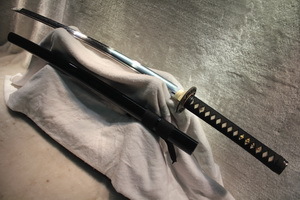 It is recommended that the blade is coated with a film of oil when it is about to be stored. The thickness of the oil film is to estimate according to the period of storage. 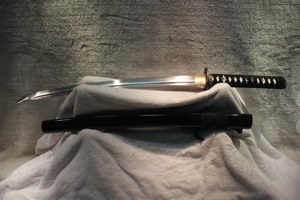 It is strongly advised not to expose the sword to elevated temperature or to expose it to sunlight for extended time; when it is not properly cleaned, this exposure can induce the release of moisture by the saya –moisture is captured after a cut session- which forms a rust attack to the blade. 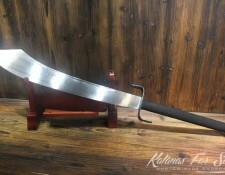 This can slain the sword and reduce the durability of the edge. Rust can be avoided by applying the Choji oil film. 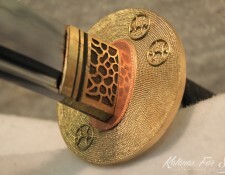 Before that operation, it is necessary to clean the blade using paper rice. A non abrasive powder ball is essential. 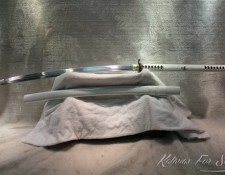 It is essential to proceed regularly to the cleaning process to keep the blade for long time. When handling the blade, avoid touching the very blade with hands or any other humid surface to avoid moisture deposit and formation. 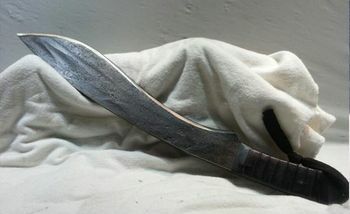 Simply use a cloth patch to avoid direct contact of the blade with the hands. It is also important to be very careful to avoid injuries. Absolutely recommended!!! 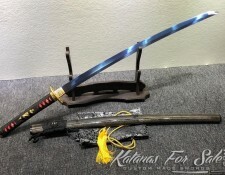 I already ordered 3 swords and each time it was way better than I could imagine it in my mind! Thanks a lot for a professional service and attention to details.